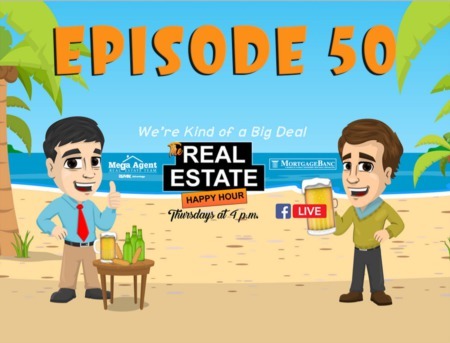 A BRAND NEW episode of The Real Estate Happy Hour Show is Coming in Hot and is on the air! On today’s show Collier Swecker and David Arnette are going to be talking about the Top 10 Upgrades Home Sellers Can Male to Sell Their Home for Top Dollar, An Update on the Mortgage Interest Rate Forecast for 2019, and an Update on the Real Estate Market Statistics. Of course, there will be a stock pick or two. Join us live every Thursday at 4pm for the Real Estate Happy Hour Show! Subscribe to our YouTube Channel so you won't miss an episode! Subscribe to our podcast so you won't miss an episode! Search for Real Estate Happy Hour Show in the Apple or Google Podcasts app or click the RSS link above. Collier: All right, it’s 4 o’clock on a Thursday! (Music in the background). Collier: It’s time for the Real Estate Happy Hour! David: Now we’re back! There we go, how we doing? We’ve got a little red Corvette coming in. David: They’re coming from all over the process, we’re talking about 14 little red Corvettes. Collier: Well, Prince’s estate can buy a few I’m sure. Collier: I mean what a, what an artist he was right? Collier: Absolutely! Boy it is, what is today? January the 17th? Collier: And it is pouring rain out there. David: It’s raining and it’s grey, it’s a little cold, but look this time of year I would say that it’s, it, we’re one day closer to March. David: ‘Cause I know there’s gonna be spring sometime in March, now in Alabama I guarantee you we’re gonna have some cold, but. David: But, it’s still March so. Collier: And we, we haven’t seen snow this year. David: When it gets here. Collier: I mean not that we ever get it, but when we do, we get it right? Collier: But anyway, man how’s your week going? David: Man, good, good, it’s been a busy week, it’s Thursday so we’re having fun. Collier: Brady, Brady, big captain of the basketball team. David: Yeah, that was a lot of fun, that was a lot of fun and. Collier: That’s your son yeah? David: We won that game, so we won 2 games in a row, got another game tomorrow so it’s been fun, we’re wrapping up the basketball season, so he’s having a good time over at Chelsea, so happy about that. Collier: You see this thing? Man, ‘cause I know you’re like me ‘cause I don’t watch a lot of network TV and Netflix, did you see they raised their prices by 2 dollars. David: Yeah and I think it’s funny, the first time they did this years ago I thought they were crazy, for raising the rates and obviously I was, I was. Collier: But that was what? 7 dollars? David: Yeah I was wrong ‘cause it shot up after that, but and we’re also gonna cover Netflix and the stock highlight but I did see that, we’re gonna talk more about their numbers and that stock here petty soon or later on in the show. Collier: What, you know, you know what’s really interesting is, I was listening to something with or reading something about, I can’t remember where I saw this if it was the Wall Street Journal, but they were talking about price creep, w’re getting in that situation where everybody is cutting the cord, so everybody’s going the other way, so when they did that so these guys know this, and all these little services that we all compiled to cut our bill in half are now going hey, it’s just 3 dollars, hey it’s just 2 dollars. Collier: Then you add your 8 services together and you’re right back where you were. David: Yeah, you think about that and you know life has turned into it’s just 2, 3 dollars, it’s just 35-dollar bags. Collier: Oh, it’s just, don’t worry about it. David: It’s just, it’s just the 12. David: It’s just the 12 dollar launch of an airplane, you know it’s, it’s funny yet how things creep up like that, how they add a little bit, a little bit of income, a little here and there.? Collier: Well you know, I find it interesting too as I was getting ready for today is that, did you know that like lot, a lot of these Internet providers cap off, like AT&T caps it off at 1TB right? I don’t even know what streaming, I don’t know what that, how that, how much that means. Collier: But what they’re doing is, they’re retaliating because people are getting a lot of them provide cable, let’s say you’re in I don’t know, some town that has their own local monopoly right? And what they’ll do is they’ll put a cap on it so. Collier: And say, and you lose any says they had. David: And then it starts, and then it starts slowing down right? Collier: Right and what’s interesting, if you’re in a major metropolitan area with spectrum, even though their customer service tradition was that I, I, I just switched to ‘em again not bad this time around, but what’s interesting is when they, when they bought Time Warner or whoever the cable they bought, the FCC said in order for that to happen, they could not could put a cap on the data you have it until 2023. David: And that’s good news and I tell ya, one, within this problem with data and streaming and how fast speeds are, when we cut the cord and switch to the Fire Stick I believe. David: So, Internet TV but we had AT&T was too slow, AT&T was just too slow in our neighborhood to run that and phones, video games, iPad, whatever else you got going on and so we had to switch to Charter. David: ‘Cause the speed was. Collier: You know AT&T told me they, you know I called them and said hey what’s up man? You know ‘cause I’m getting, supposedly get 24 Gigs whatever, 24 megabytes whatever it was. Collier: And so here’s the excuse was well, tell your wife just to turn off whatever she’s watching and let you watch yours. Collier: I said that makes a lot of sense and what about the 9 year old? Oh, that’ll work too you know so. David: One thing, one thing that’s cool that we’ve done, we’ve got, we bought a Google Wi-Fi, so there’s 3 Wi-Fi points in the house and you know, look y’all gonna laugh at me if you’re, you’re already being doing this but. David: But the app actually allows you to go in and select a device to prioritize so. Collier: So, yours is prioritized? David: Well so, when Brady’s there he, he wants the priority on the Xbox. Collier: So, can he move it? David: So, he’ll text me and say put, put the priority on the Xbox. Collier: Put it on this guy.? ?David: Yeah.? Collier: The rest of the time, just goes to you ‘cause yeah your family goes to bed early anyway. Collier: Hey, did you see, did you see this? This is, you and I talked about a month ago about, you know how financially illiterate a lot of these kids are coming out of high school are, found it very interesting in Florida a, a lawmaker down there has introduced a bill that would make it mandatory for personal finance classes in the 9th grade for a half credit. Collier: Course, I don’t know what that means in terms of hours but. David: I think it’s great, you know I know Brady took a class in finance talking about some credit card interest, talked about some pers, you know checking account or you know a balance in. David: Checkbook can do and doing some basic, really basic stuff but I think it’s a shame how little personal finance we learn, just yeah. Collier: Where does the check go right? Collier: What does a, what does that overnight lending rate mean right? I mean and the other thing is if, if you’re getting through high school and they’re supposed to be teaching you about life and you haven’t filled out a fake, not a fake tax return if you mind the IRS is listening, I mean like a demo. Collier: Fake tax return, it’s the one thing you’re gonna do for the rest of your life. David: And there’s, there’s a lot of things even, even like not understanding that you’re paying interest on a credit card, you know you went and spent. David: A thousand bucks on a credit card this month and you have a minimum payment of let’s just say, 45 dollars and you think that’s all I gotta pay this month. David: And you don’t, you don’t realize that that 45 dollars is not going towards your balance first. David: It’s going to pay the interest first. Collier: It’s going towards Daddy! Collier: I mean Daddy the bank! David: That’s right, there’s a lot. Collier: It’s gonna get that money. David: Yeah, a lot of simple things like that it would be awesome if they learned in school or learn at a much younger age. Collier: Well I mean, imagine we talk about it all the time! About I mean if they learned the power of compound interest and you’re 16, you’re putting, you work a summer and then you get the thousand dollars that you made and you put 500 in a roll. Collier: You’re gonna be on your way to being a millionaire at very early age. David: Yeah, it’s tremendous help how much difference you can make if you flip your savings from between 15 and 25, rather than you know 45 and up, I mean you would. David: You would make a tremendous amount of money, matter of fact you know, you can save a little bit from 15 to 25 and be done. David: Well, it’s gonna sit there and grow for 30 or 40 years and people just don’t think that compound interest, and how much it kicks in, you’re 25 years, 30 years, 40 and how much you’re making at that point. Collier: I mean even at, at later ages too people go I’m 45 too late, 55 too late, no it’s never too late. Collier: You’ll bail yourself for those things. David: Yep, definitely gonna get started early. Collier: Well, talk about interest rates. David: Ok, so interest rates right now it’s a, it’s a big story, you know we’re gonna talk about the Fed reversal later on in, in the stock block, but basically, you know if you go and pull up some stocks lately. David: The Fed reversal was when the Fed changed their tune ok? Back in October of last year, they were still talking about we’re not even close to neutral, which meant that we’re gonna have to still be aggressive on raising rates and they said they took a lot of heat from President Trump, they took a lot of heat from Jim Kramer, from anybody that watches CNBC and they know Jim Kramer, but the Fed was taking a lot of heat from a lot of people on what they were saying, and how aggressive they were on raising their rates, which translates to everything else. So anyway, right now, interest rates, 30-year mortgage rates around 4 and a half, some days a little bit less, some days a little bit more, the big thing I wanna talk about this week was the revision ok? And from this Fed reversal and I, I say Fed reversal because they reversed their, I guess their verbiage right? They reversed their message, they, they backed off they said we are gonna stop and watch, we’re gonna check the economic indicators before we get back on this aggressive pace. Collier: ‘Cause they were doing Willy nelly, I mean they had, I shouldn’t say Willy nelly, they had a plan, they were executing their plan. Collier: Regardless of what was happening around them. David: Right, exactly and, and you know they, they reversed it from 3 hikes this year, they turned that down to 2 hikes and then, they also backed off saying we’re gonna know at the next meeting and going forward we’re gonna look at the data, we’re gonna look at the economics. Collier: That’s good of them, I’m glad they are. David: So, I just think is interesting, you know there, there are certain things that we get with mortgage rate projections, so the projection for mortgage rates this year for most, as of 2 to 3 weeks ago, a month ago was 5 and a half in 2019, you know stepped up through the 4th quarter, but we’re gonna end the year closer to 5 and a half. Now since then, in the past week I have seen those revisions change down to 4.9 or you know right around 5. Collier: Now, who’s coming up with these forecasts? Collier: Because I mean, my God. David: So, who’s they right? David: So, so, they is the National Association of Realtors, it’s the Mortgage banker association, it’s other economists. Collier: I trust them, I don’t trust the National association of realtors. Collier: Decide what y’all interest rates are gonna be. David: But I mean, but these are economists that are looking at the stars right? David: And they’re seeing what things are, so I just think is interesting that in, I mean it’s January the 17th, so we’re halfway into the first month of the year and we’ve already revised our interest rate projections down a half point. Collier: And now, I am wrong in thinking that, that we’re not letting the free market roll here in that mortgage bank should be able to set their rates and I understand that y’all abiding, let’s call it Bank of America if they wanna loan more money, lower your interest rate, they wanna lower their margin that sort of thing. I mean why are we so tied to the Fed on this stuff? David: Well it happens to a certain extent, but there’s always a value for the, the rate, so some banks can cut their margin and shave it a little bit, but at some point you’re, you’re losing money ‘cause you cut the rates too much and then you’re losing money on your whole portfolio business that you’ve got, because people are gonna start refinancing on the loans you got right now. So, it just doesn’t make sense to, to get too aggressive on your own, now if the market drives rates down then you’re gonna go with the market, but just to go out rogue. David: Getting rates at 4%. Collier: Well and the problem is I think when you do that too right? Is that you’re not gonna be able to sell them to them, ‘cause you’ve now done certain things to that loan where they’re not as sellable, I would assume. Collier: They’re not as profitable. David: Yeah so, I think, I think the big, the buzzword coming out of 18 is, is affordability ok? David: So our, our, price appreciation on houses has been 5% roughly national, average, whatever, that is gonna slow down, it’s not going away, it’s not stopping and rates are still gonna creep up. So, affordability how that’s affected means that you know the house is, is, has risen a little bit in value and your interest rate has also gone up a little bit, so you’re paying a little bit more for it and the financing cost you a little bit more. Collier: I know we talked about this a few weeks ago, but is there any scenario in this environment where you see refinancing as anybody’s. David: Yeah I mean, actually I had a guy checking on it today, but they’re looking to switch from a 30 year, a 30 year to a 15 year, let’s say they’re 3 to 5 years into a 30 year ok? David: So, they still got 27. Collier: Still paying all the interest? David: Yeah, 27 to 25 years left and then they cut that down to a 15 year, that would make sense. Collier: Ok so, so, basically we’re gonna need to see a step down in years. David: Yeah and what I wanna, what I wanna bring up there in the refinancing, I want people to be cautious on a lot of lenders will throw out a, well you know let’s say 400 dollars a month. Well think about what you’re doing there, if you’re rolling in a car loan that you were paying for 5 years, you’re rolling in a bunch of credit card debt, you might truly be saving you know 2, 3, 400 dollars a month, but are you just stretching that right back out over 30 years, so are you managing that, you know in order for that to be a good financial decision, you kinda need to turn around and do something with that savings, don’t continue to spend the excess. Collier: Well I, I, I can tell you this as, as interest rates went down, we, we made, you made us a ton of money in our equity because you, you advised me every step of the way our prices went down, our rates went down a little bit, whatever and you took me, you said hold on you can keep the same payment, but let’s move down to a 20, then we moved to a 15. David: Yes, you’re shaving time off of it. Collier: And I was just shaving time but at the end of the day, we’re now since 2011, 60, 70 thousand dollars difference in where I was, I mean where I could’ve be and where I am now, I mean that’s a massive number. David: Yeah that’s a big number and I think a lot of people forget, you know the power of time we’re so immediate right now, you know the society. Collier: Oh yeah, I need this money. David: Everything happens immediately, but you know give, give you know the market some appreciation, obviously helps too, which, which we’re gonna continue to see. So, that house as an asset is still a good idea. Collier: Absolutely! You just gotta keep ‘em nice, you know you go into some of these houses now. Collier: I tell ya, some people I wonder know who’s running the hen house you know? David: Well, I want us to move on we’ve got our Birmingham market stats updated, it closed out last year. Collier: Yeah, you know one of the things we’re at, we’re well I say it all the time, relatively all the time and my, since I’m at my working life we have all the time inventory lows, we’re now down to less than 5 thousand about 47 hundred listings on the market at any one time and. David: In, in Birmingham area. Collier: In the Birmingham area. Collier: And what’s really fascinating and you alluded to it just a second ago, which was we have low inventories, but our, the average sales price’s still shooting up over almost 8% increase in sales price. David: And that’s year over year so January. Collier: December to December (in unison with David) and, and one of the biggest issues that we’re facing is a situation where we are worried that prices are outpacing the ability of people to actually fill those homes down the road, we gotta slow it down a little bit and the price, as price appreciation because every, every month when we’ve brought these to you we’re looking at 7%. Collier: 8%, at some point this has gotta stop. David: Right and I wanna, I wanna highlight ‘cause you know everybody when, when they start to think about buying or selling a house, they look at numbers right? They look at national stats because you usually don’t care about what’s going on nationally right? You just care about what’s going in Birmingham, but when you’re in the process you pay attention to these things a little bit more. So, when I’m throwing out that 5% early, 5% appreciation, that’s kinda more of a national number, you see here year over year we’re at 7.8% in the Birmingham area. David: Now the Birmingham market has typically been stronger and more resilient than national numbers right? Collier: National numbers, but we also didn’t see the double-digit increases. Collier: That they did, now one of the things it’s interesting the number of homes sold last month, remember we, we decreased significantly and I don’t have that percentage here, lack of me, let’s see it was an 11% decrease in inventory. David: Ok, year after year. Collier: Eleven percent, yes and then you had a decrease in the number of sales of single-family homes by 5% and then, if you add in the town homes you’re looking at a 10% total to almost 20% in the number of condos and town homes. So, you ended up averaging there because of the sheer number of single-family homes, you had a, about a 10% decrease, but you had again the average sales price way up. David: Yeah, yeah and I think, I think this, this goes to and I feel like the Fed is, is changed their tune because of the effects they felt on the housing market and I really feel like that’s why this year’s gonna be a great year because rates are going to stay calm and so, we’re gonna have that normal influx of inventory that’s gonna answer some of these issues that we felt last year right? Collier: Right, right, I mean you know I was looking over some of our areas in the area to kinda get an idea, I mean you take the Hoover area you know average sales price again up 8%, down on the number of homes sold, you know 3.4% in sheer numbers, townhouse condos in Hoover last, last month 8, a total of 8, (laughter), 8 and that is a condo townhouse, that is a market that has a lot of ‘em. David: Yeah, you know in Alabaster they’re up 15% year over year and that’s average price. Collier: Average price, but look at that down 21% in the number of homes sold, inventory down 10%. David: And there’s been a lot of growth last year in Alabaster. Collier: Vestavia Hills, if you’re in Vestavia Hills down 16% in inventory. Collier: Look, number of single-family homes up I believe are the major metropolitan areas, only one that increased buy by 3%. Collier: But look at that average sales price. Collier: 38%, now that, now granted you didn’t have a lot of sales in, in Vestavia Hills, but it just. David: And some of those sales might’ve been higher dollar to throw that number off a little bit. Collier: Absolutely! And I think one thing that, the big takeaway you can take from something David said just a few minutes ago was everything and he didn’t use exact words, which was hyperlocal. It doesn’t matter you’re talking about the national numbers, I’m saying take that same philosophy here and say you can’t take Alabaster and compare it to Hoover. David: Yeah and I think it’s, I just think it’s funny because I was just reading something last night about the fact that, you know most people don’t care about that real estate section of the Wall Street Journal. David: They don’t care about real estate headlines on CNBC, but when you’re buying a house, you’re selling a house you do, you tune into that stuff. David: And, and it’s important to work with people that are paying attention to not only what’s going on nationally, but also you know. David: Local, local numbers here. Collier: Anyway I tell ya, but overall it was a mixed market we, we need inventory if you’re looking to sell, hey it’s a good time there’s a lot of buyers still out there, now that being said we’re getting more, you know we keep, how long have we been a seller’s market? A long time now the sellers have been in control, we’re back to 5 months of inventory I got you to do the math the other day for me, we’re back to 5 months of inventory, 6 months is a balanced market, which means there’s an equal number of, of buyers and sellers, it should be to just absorb the market over a 6 month period right? Collier: And it but, the buyers are gonna steadily become more in control. David: Yeah and the buyers are gonna be a little bit gun-shy coming back this year I think with, one thing people did get tired of was the 10 and 12 offers on listings, so we’re hoping that you know we just have some normalcy to this market. We’re gonna have a good number of buyers enter the market, there’s already some sitting there waiting, we’re gonna have a good number of buy, houses into the market, you know for inventory. Collier: Well it’s picking up, now we, we just gotta exceed the numbers I mean to get back to where we need to be, we’re gonna have to see not only the normal sickle called number of sellers, we’re gonna need to see that. David: But I also think that, that buyers are also gonna see those rates around 4 and a half and be a little bit happier. Collier: I’m ready to roll. Collier: Well so, the millennials are gonna be real happy ‘cause they’ll stay in it, the Alabama hammer said it’s already a buyer’s market, sellers don’t know it yet, it could be the case it’s very much of a lag measure, are you buying any time soon Slocum? I bet he’s buying him a big house at the beach, what do you think? David: If he’s hunting that big duck, big buck. Collier: No, yeah, yeah, yeah, he’s going hunting for the big buck. Collier: Yeah, I, I, one of my favorite hey. Collier: One of my favorite ones was the one where he was at the casino, I forget the one where he’s smashing the slot machine but or, or making him dance that’s the new he’s got, where he’s making it, he’s shooting at the feet, but anyway the Alabama hammer, all right. Collier: Wall Street Journal comes out with a top 10 upgrades for 2019, that you can put in your home and wow what a list, and specially there is, José Morales how are ya my friend? Luis Morales. David: We’re looking at the top 10 to sell your home for top dollar. Collier: Absolutely! A lot of these, the reason I mention him, he’s out in the West Coast and a lot of these are things that they already have ‘cause the West Coast usually follows us 2 years later, so y’all probably laughing. David: A little bit more “cram molly” in the South, a little bit more detail on the woodwork in the South. Collier: Yeah, yeah, that’s right, that’s right, yeah, they, they, I always call theirs, their stucco’s more like a taco, you know the Taco Bell’s material? Collier: That’s stucco right? A lot of their houses out there right? Easier construction I guess, but they still gotta deal with earthquakes and stuff so. Collier: (Laughter), dance for the Hammer that’s right, all right here we go. David: It’s an interesting one, retractable glass walls. Collier: Yeah a lot of times I’m pulling out of the French doors and expanding that wall, and having the accordion style. Collier: I’m sure the Alabama Hammer has that too already, but this accordion style’s creating that outdoor space and bringing it inside. David: Yeah, you know that made me think was the, at some of the coffee shops you see the garage doors that, that roll up. Collier: Yeah, that would be. David: And open up a whole area, I always wanted to put one, a couple of those in the living room. Collier: Courtney’d love that right? That idea. David: Yeah on the back side of the living room, but. Collier: You know it gives a traditional floor plan, a very modern sleek look you know? Collier: Next one, they found was high ceilings. David: High ceilings? That seems, obviously you gotta have room because you, if you move the ceiling up you run into the bedroom upstairs, you can’t move it. Collier: I mean this is a tough one, if you already have an existing house and what are you gonna do? Hey Brady, I’m sorry. Collier: But we’re getting some new ceilings. David: We’re gonna lose a bedroom, but we’ve got high ceilings. Collier: Yeah absolutely, I mean. David: Or I could just shrink the bedroom, make it (laughter). Collier: (Laughter), yeah well, they’re little, they’re 8. David: Yeah put a bunk bed up there, it looks like a loft. Collier: Absolutely! Court’s counter tops! The big one for 2019, you know they’ve been around for a while, very durable ‘cause the mix of the composite and the natural stones. David: Yeah, yes, yeah, next one Butler’s pantry ok? If you’ve got a Butler certainly give him s pantry. David: What are you doing with that? Collier: Hey dude, we’re not on a cruise. Collier: Anybody knows what a Butler pantry is, it’s most times, in most of the houses we see is the area going between the kitchen and, and the dining room. Collier: Oftentimes, it’s where you store all the stuff you got at your wedding and you know you never use. Collier: That goes in the Butler pantry or better known as in the Happy Hour, where the ice thingy is, you know where you put your. Collier: Where you pour your drinks. David: Martinis, it’s where you shake ‘em up. David: Next up, is spa bathrooms, free standing tubs, fancy stuff huh? Collier: Steam showers, heated floors. Collier: Japanese toilets, by the way have you tried one of these? Collier: These things squirt water in places I didn’t even know water was squirted, you know the best thing is though they do have a little thing that says pink or blue for men or women, ‘cause the other one can surprise you if you don’t watch it. Collier: I tried the one in Tokyo. David: Yeah, you know that from experience. Collier: Oh yeah, Aman, Amanda she hit the wrong button. Collier: And next thing, she had like this thing it was like a water show at Bellagio, it was going everywhere. David: (Laughter), should had a Facebook live of that. Collier: Yeah, but yeah they’re cool, they’re really cool, they’re expensive, again I’m sure the Hammer has that too. David: Absolutely! He did floors, now I do like that. David: He did floors and the bathroom. David: Well in the wintertime, ok so we don’t have maybe enough of the winter down here, but. Collier: How me, it’s cold now. David: Up north might be a good idea.? Collier: Smart home systems we talked about it a few weeks ago, if I were to say one of the hottest things in our market is I don’t care if you can resell your home and it’s a, couples got a used house.? David: It’s a used house. Collier: But you’ve been living in it and you want to give it an updated feel on top of a lot of finishes, throw up a Nest thermostat, people think you’re updated the entire home. David: Yeah, the Nest thermostat, the Nest cameras, Nest has a whole family of, of products now that they’re adding on there, but I think some of that stuff is very cool, you can control the lights, you can control obviously the temperature, you can. David: Yeah, yeah, you can speak to delivery people right? ? ?Collier: Or the crook, hey, hey boy! What are you doing? David: Yeah, yeah, like Mayhem. David: And he break into his car. Collier: And then you need that guy, you need the guy that gets beat up. Collier: Mr., what’s his name? Captain Mayhem? Collier: Yeah, yeah, all right. Collier: Absolutely the four car garage, you know the problem is we have too much stuff right? And one of the things they mentioned was. Collier: They wanna marry your cars in a garage WITH your stuff, that now there’s a room for all that.? David: Hey now, speaking of stuff if you guys had not yet seen Marie Kondo’s Tidying up, just look on Netflix. Collier: Amanda’s watching it, she, she keeps. Collier: Talking about it, is it crazy? David: The, the Japanese lady, she’s so sweet and when she meets the house, she goes and thanks the house. Collier: (Laughter), yeah we met. David: It’s the greatest, it’s the greatest part of the show. Collier: Amanda said you’re supposed to thank, if you’re going through your closet and getting rid of stuff. Collier: You’re supposed to thank the clothes. David: Yeah, thank it and then throw it away, but she gets down on, she gets down on her knees and shuts her eyes, and does this little ritual, where she, she’s talking to the house. David: And it’s hilarious, so the rest of the family is behind her, they’re kinda open there is she still doing something what? Collier: We were talking about Netflix earlier, and now we know what you’re watching. Collier: You’re watching a Japanese lady praying to her clothes or. David: Hey, she’s thanking the house. Collier: To the underwear, all right, barn, next thing barn carriage house or in-law suite or apartment, use it and using it as extra sleeping space, office. Collier: Guest space, more storage, that would be us, it would be more of our junk going somewhere. Collier: But really of utilizing a space, so that you don’t have to a lot of times move right? So, that somebody can buy this house and already have a space for their office, ‘cause I know a lot of folks working from home that don’t wanna be interrupted during the day and I can’ tell ya how many times I’ve tried to work at home, Amanda and Julia walk in and hey 1 question, just 1 all right? What’s the question? And then, 10 minutes later hey. Collier: One question, we only got 1 question! You know? David: Yeah, 1 every 10 minutes. Collier: Well yeah, you could say that. David: Now this is, this would definitely be in certain areas, I don’ know that a generator would be a big one on my list that. Collier: If you’re over 70 it is, I think right? We only see a lot of old people with ‘em. Collier: Yeah, you know I didn’t wanna be without power. Collier: You got the generator you get in hurricanes, if you’re in a hurricane prone area, if you’re in tornado prone or. Collier: A thunderstorm, I mean who doesn’t? You know the worst part I tell ya this is a funny story, while I was at Auburn we, we went to, I remember the hurricane was coming through and man we were so excited and we had a, we went to buy coke or something, when really we were buying beer, but anyway we went and bought beer thought that was a great idea. So, then we thought great! When the power goes out let’s rent a few movies. Collier: We were talking about it the other day. Collier: I mean what idiots, we were like man that was, the power being out let’s watch movies. David: Yeah there’s nothing else to do, let’s watch a movie! David: The next one, neutral décor which is interesting, so, so light grey is now you know. Collier: Well, of course the other grey’s the beige of yesterday right? David: The beige of yesteryear. Collier: Yeah but heavy, they talked about heavy brown furniture being out, of really everything being neutral, the flooring not making an impact and letting the statements be made in other ways, maybe with art or that kinda thing, making sure that. David: Let the statements be made. Collier: So, so make sure that light grey and the heavy brown furniture is out, so those the Wall Street Journal coming out with the 10 things that will upgrade your house, that you can use. Collier: To upgrade your house. David: And you heard it here first! Unless you saw it on Wall Street Journal. David: So, next we got wanna come back to Netflix to finish up the show today, we’ve got the stock pick and since we led with the Netflix price increase, I wanted to finish up and just and first thing I pulled out today, I guess Netflix reported after the bell and they’re down following their earnings ok? So basically, their report today so the stock’s down after hours, they fell below projections for revenue for the, for the prior quarter, lower than expected guidance for Q1 2019. David: I thought it was interesting, subscribers additions came in above estimates. Collier: Well that came in above estimates, but at that lower price point right? And what, and what we’re seeing is they’re doing so much original programming. Collier: That Netflix is incurring massive cost. Collier: That they’re not able to keep up with. David: Well but that’s ok though, because I think they’re drawing people in, see what I think it’s interesting is there’s gonna be a lot of people moving to simplify that 150 dollar cable bill that, that we’ve had for years and that’s really driving the big, you know the big switch right? Cutting the cord was all about, you know cutting the cable companies out and saving some money, and Netflix is kinda the first one to the party with eyeballs. David: And they’ve already got people. David: And most overpriced stock in the market, yeah might be a joke, but right now it is killing it! So, the joke is on You! If you don’t have it right now huh? Collier: Hey well, hey Hammer all right, give us an alternative in that entertainment space that you’d say is a stock that is worth owning, that has value. David: Yeah but I, yeah I think it’s interesting it is, it’s gone way up so and it’s, and it’s whipsawed around I wanted to bring up 420 dollars a share, Slocum likes Apple. Collier: Oh it’s quite true, that’s a even though. David: Yeah great stock, different industry. Collier: Good entry point in Apple. David: Yeah, yeah, different industry but I thought it was interesting their, their additions came in to 1.5 million subscriber additions domestically, 7.3 million international. David: That’s, that’s subscriber ads. Collier: What, what I don’t understand is international. Collier: I don’t see how they get, hey Slocum you’re 1 thousand, I can’t tell Slocum he’s right a thousand times. Collier: But he, he’s right. Collier: And the, and the biggest thing with Apple is that cash. David: Apple is, is the same. Collier: We talked about it last week, about Southwest? David: No, no, I mean Apple is a great stock, Apple is not the same industry right now, I, I can’t go with iPhones versus movies, I, I mean I can’t do it, they might try to get into the Netflix business, but right now I mean you, you might as well throw Google in there. Collier: Wait, hey you wanna say Disney, well Disney is, is getting in their streaming space and one thing I am worried about is that we’re gonna see more streaming. David: But I still, but I still think if you ask anybody what Apple is, it’s an iPhone. Collier: This guy, well I mean I agree. David: What do they sell the most of? David: iPhones yeah, that’s just in my opinion, now they make into space and kill it, they do have a lot of money they could definitely do it. Collier: And we talked about it last week, why is it that Southwest has been able to do anything they wanted and that’s ‘cause airlines are pretty much the same way, it’s ‘cause they took the same approach Slocum’s talking about with all that cash, you can do whatever you want to. I mean, I thought years ago Apple missed an opportunity to buy Dropbox when they should have. David: But, but don’t you think. Collier: There you go, Netflix earnings a doll, a penny a share, no cash. David: Right, don’t you think there’s some barrier for entry though in there? Slocum for the, for Apple to make their own content will get expensive right? So, they don’t, I don’t know that they know much about that business at this point. Collier: I mean it’s interesting, I mean and this goes down to the, the kind of investor hold on, I know you are a well, how would I say this? A, a gambler at heart on this stuff. Collier: And Slocum’s taking it more ironically, it’s a more, more conservative approach, huge entry to enter in the course. David: Yeah, yeah so, for people that don’t have money to, to pay the fees to get in there. David: Yeah that’s, that’s definitely true so Apple’s got it, but Apple I guess Apple could go out and hire talent, I think it’s interesting the, the bottom on Netflix was just. Collier: Three weeks ago something like that? David: Yeah, it was just in December. David: At 230 dollars a share, right now today it closed at 350 and after hours was down to 344. So, interesting the Fed reversal we talked about earlier in the show, Netflix was at 230 now they bounced back up at 350. Collier: One thing we can ask Slocum about , Slocum had, owns, I know you, Slocum don’t you own a class, at least 1 class A share of Burt’s your Half away? ‘Cause they pay a dividend the big, the big regular at Burt’s your half away, Burt A? David: I don’t know, I should know that. Collier: I mean as much as, as much as, as much as you pay for it, I mean you, this is the shares that you are owning a piece are right there with what, Warren Buffet. David: Well interesting, interesting, interesting talk on Netflix, I think Apple definitely has the money to do whatever they wanna do, but then they’re just gonna have to catch up, so Netflix till then. Collier: Well what do you think about Disney getting in? I mean, I worry that I mean if we get too many of these competitors, see it’s so nice now when you can go to Netflix or Amazon Prime, but when you got Disney getting in this, in the, in the fold and all these other companies, I, I mean I worry about that, that, that, that we’re gonna end up back where we were, where you got 80 options. David: Yeah now you got, now you have you know 20 subscriptions instead of just 1. Collier: We’ll say, what do you say? David: It’s all in many years ago. David: Blockbuster’s founder is crying at what Netflix is doing, yes. Collier: You know I, there’s a good series that I listen to on podcast and the compete, it’s called “Business Wars”, a great podcast and they take 2 companies and they tell you the back story, and that one’s really interesting between Blockbuster, I mean they had an opportunity and they blew it. Collier: So anyway, well that wraps it up this week it’s been another great week, we appreciate everybody stopping by, we will be here every Thursday 4 o’clock and don’t forget to download the podcast, it’s anyway you can find great? Collier: Anyway you can get good pod, Apple podcast, Google podcast, Spotify, Pandora, but anyway man. David: Yes! Y’all have a great week and we will be back here next Thursday! Collier: All right, see y’all soon! Bye bye!